So I met up with indefatigable editor Stephen Jones and several other local bookish characters for pre-Christmas drinks, and he pressed into my hand a volume of one of his latest books, Haunts: Reliquaries of the Dead, an anthology of new and reprinted ghost stories. 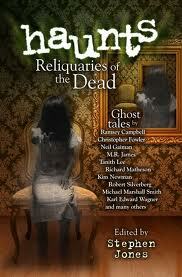 It features numerous luminaries of the horror field, including Christopher Fowler, Tanith Lee, Neil Gaiman, Kim Newman, Michael Marshal Smith, Lisa Tuttle, and also includes a rewritten version of one of my early short stories, 'Inheritance' - my ninth published story, in fact, which appeared in The Magazine of Fantasy and Science Fiction way back in 1988. I'm best known for my science fiction, but I've been a fan of horror stories from way back, turned on by Universal and Hammer films, the Mayflower horror anthologies, the Pan Books of Horror Stories, and the stories of M.R. James. On Christmas Eve in 1968, while the rest of the family were at Midnight Mass, I was frightened half to death by Jonathan Miller's famous TV adaptation of James' 'Oh Whistle and I'll Come To You, My Lad'. Lonely beaches never seemed the same afterwards. And now one of my stories is between the same covers as one of the master's, 'A Warning to the Curious'. How cool. Also cool - my novella, 'The Choice' has been selected by Rich Horton for his Year's Best Science Fiction & Fantasy 2012 Edition. Table of contents here. Long ago, during a class that introduced me and a bunch of my 11-year-old peers to the school library (where I soon discovered a complete set of H.G. Wells' work, but that's another story), our English teacher asked a question: 'Where does Sherlock Holmes live?' My hand wasn't the only one to shoot up, and I forget who gave the correct answer. But I do remember that as far as our teacher was concerned it was the wrong answer. 'You see, boys, Sherlock Holmes was never alive. So he could not have lived anywhere.' I've never forgiven him for trying to turn the treasure house of the library into a mausoleum. He picked on Sherlock Holmes because Holmes is one of the most famous fictional characters in fiction, who had one of the most famous addresses in literature: one of us was bound to know the answer (you know it, of course). Sherlock Holmes is so famous that you don't have to have read any of Arthur Conan Doyle's short stories, or to have seen any of the numerous films in which Holmes has appeared (more than any other fictional character), to know several singular facts about him. I first encountered him in an anthology of the original stories, in a limp-covered volume dating from the 1920s; I've just encountered him again in a preview of his latest film incarnation, Sherlock Holmes: A Game of Shadows. Oh dear. It's the sequel to director Guy Ritchie's first Sherlock Holmes film, which turned Holmes into an action hero in a lightly steam-punked Victorian London, and featured rapid-fire comic banter between Holmes (Robert Downey Jr) and Watson (Jude Law) and elaborate bullet- and explosion-ridden set pieces punctuated by sequences of slow motion, time-slicing, and other techniques Ritchie previously deployed on his gangster films. I thought it was rather good fun. Sherlock Holmes: A Game of Shadows is more of the same, but ups the stakes by introducing Holmes' nemesis, Professor Moriarty (Jared Harris), whose fiendish plans soon puts a crimp in Doctor Watson's honeymoon. The plot is very loosely based on 'The Final Problem', the story in which Conan Doyle tried to kill off his most famous creation. It kicks off with an explosion in Strasbourg and an encounter between Holmes, Irene Adler, the femme fatale who helped him in his previous adventure, and a fistful of goons, and barely pauses for breath in a headlong dash that involves gypsies, anarchists, a chase across Europe, and diplomatic skulduggery. It's not a bad film, as noisy spectacles go. Its varied locations are packed with period detail, Downey turns in another fine comic performance, Law's Watson is an able foil to Holmes' quick-fire eccentricities, and the postmortem reveals of how the great detective foresaw and confounded the knavish tricks of his enemies are as clever as in the first film. But it isn't as good as its predecessor, doesn't add anything new to the canon, and it doesn't quite know what to do with most of the supporting characters. Although Mycroft Holmes is drolly played by Stephen Fry, the script doesn't do much to show that he's Holmes' smarter, older brother, except to call him Sherly. I would have liked to have seen more of Simza Heron (Noomi Rapace, who played Lisbeth Salander in the original Dragon Tattoo trilogy), the gypsy whose brother has been caught up in Moriarty's plans. Rapace's performance is lit by smouldering intelligence, but like the other women in the film she takes second place to the bromance between Holmes and Watson, whose sparring banter is sharp and lively at its best, and as camp as a pantomine dame at its worst (the film's humour is laid on with a broad brush: the only thing funnier than a man in a dress is a middle-aged man clad only in his dignity). The film's big problem is that in hindsight, once the dazzle and noise of the action sequences has died down, the logic of its narrative falls apart. To be fair, it's a problem common to most action films, and to quite a few genre novels, too (writers: if you rely on big set pieces to keep the narrative flowing, you're in trouble - especially if your biggest and noisiest set piece takes place in the middle of the story rather than towards the end). More fatally, for this particular action film, the menace and significance of its villain diminishes as the film progresses, and Moriarty's fiendish plan is the stuff of a thousand action movies in which the villain promotes war for fun and/or profit - Mission Impossible IV uses the same old tired trope. Here's a bit of useful advice for budding evil masterminds: if your brilliant scheme involves starting a war somewhere, it probably isn't that brilliant, and will inevitably be thwarted at the last moment. Throw a couple of henchmen in the shark pool, relax with a martini salted with orphans' tears, and think of something else. Chapter 9 of In The Mouth of the Whale is now available on the web site. Haven't started yet? Here's Chapter 1. This is the last chapter I'll post this side of the New Year. I'll put up three more early in January, taking us to the end of the first part of the novel. When it grows dark, as it does early in the afternoon, now, the details of the slice of London visible through the window of my office diminish to the spur of a cul-de-sac and a shadowy rise of land flecked with lights, and I'm reminded of looking out of the window of the attic bedroom I once shared with my brother. When I was a teenager and it became too noisy, downstairs, I would retreat to the attic and work on some piece of tyro fiction (all long lost, like the cottage), pecking at a typewriter perched on a scrap of wood laid across my knees, my shins burning in front of the one-bar electric fire, my fingers freezing. There wasn't a house directly opposite, as there is now, but there was a warehouse looming at the far left-hand edge of the gardens shared by the four cottages of which ours was the third, and there was a railway beyond, as there is here, although the railway of the lost past was not in a cutting but was somewhat elevated, a branch-line station closed just a few years before. And then the breast of the steep slope up towards Selsley village, whose lights twinkled in the night just as the lights of Highgate twinkle now, just a handful, mostly hidden by winter-bare trees. I finished a draft of the next novel a couple of weeks ago and will return to it at the beginning of the New Year, knowing at last the shape its narrative makes from beginning to end. I was thinking about a couple of short stories - the one I should write, the one that wants to be written right away - when the past ambushed me. I've been living here ten years, and it has only just occurred to me how familiar the view is, on a winter's night. Like In the Mouth of the Whale, the new novel shares the same future history of The Quiet War and Gardens of the Sun, and is set some 1500 years after the events in those two novels. 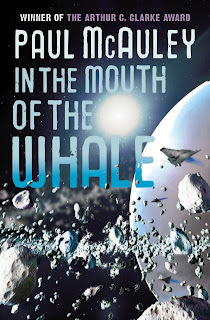 But while In the Mouth of the Whale is set in the atmosphere of a gas giant and in an archipelago of worldlets orbiting Fomalhaut, the new novel starts some fifty years later, in the asteroid belt of the Solar System. 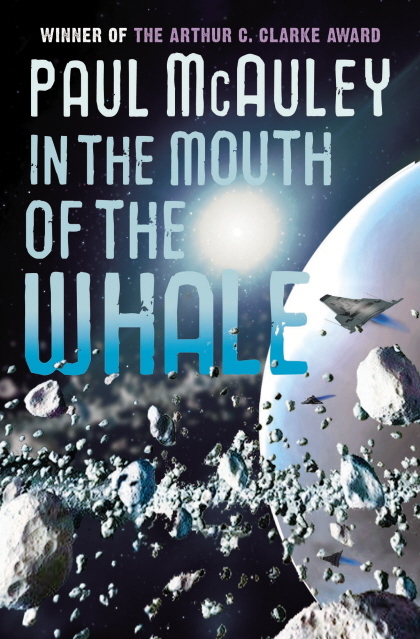 And although its story riffs off an event foreshadowed at the end of In the Mouth of the Whale, you don't need to have read one to enjoy the other, much as you don't need to have read the first two novels to enjoy In the Mouth of the Whale. It's called Evening's Empires, by the way. Among other things, it's about the persistence of the past.